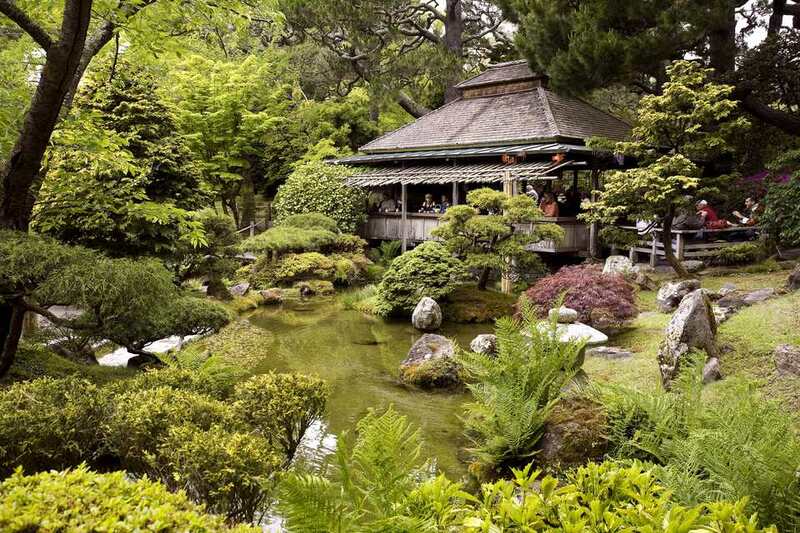 San Francisco's Japanese Tea Garden is one of the city's quietest corners, a place that is a contradiction: at the same time one of the city's most popular sights and a peaceful place to get away from the urban hustle and bustle. You can visit it when you go to Golden Gate Park. Before you go, it may help you to know a little bit about how the oldest Japanese garden in the United States got there. The garden was created for the San Francisco Mid-Winter Exhibition of 1894 as a Japanese Village. After the expo ended, Golden Gate Park Superintendent John McLaren let Japanese gardener Makoto Hagiwara turn it into a Japanese-style garden. The Japanese Tea Garden covers about three acres. You can make a quick visit in an hour or so, but you could also linger for a few hours to stroll through all the garden areas. Spring is one of the most beautiful times to visit the Japanese Tea Garden when you can see cherry blossoms in March and April. It's also especially photogenic in fall when the leaves change color. The Tea Garden can get temporarily busy and crowded when a busload of tourists arrives. If you arrive at the same time as a big group, walk to a far corner of the garden first and wait until they disperse. The Japanese Tea Garden is, first of all, a garden. Like most Japanese gardens, it's made up of small garden areas and also features beautiful buildings, waterfalls, and sculptures. Any time of year, the garden's classical structures are eye-catching (and Instagram-worthy). The entrance gate is made from Japanese Hinoki Cypress and built without the use of nails. Nearby, you'll see a Monterey Pine tree which has been growing there since 1900. Just inside the gate is a hedge clipped into the outline of Japan's Mount Fuji. The drum bridge is a classical feature that reflects in the still water below it, creating the illusion of a full circle. The most spectacular structure in the garden is the five-story-tall pagoda. It came from another world exposition held in San Francisco in 1915. In the garden, you'll find cherry trees, azaleas, magnolias, camellias, Japanese maples, pines, cedars, and cypress trees. Among the unique specimens are dwarf trees brought to California by the Hagiwara family. You'll also see lots of water features and rocks, which are considered the backbone of the garden's design. Any time of year, the Japanese Garden Tea House serves hot tea and fortune cookies. You might think of fortune cookies as a Chinese treat. In fact, you might have even visited the Fortune Cookie Factory in San Francisco's Chinatown. And you may be wondering why the Japanese Garden serves Chinese cookies. In fact, the garden's creator Makoto Hagiwara invented the fortune cookie, which he first served to guests of the Japanese Tea Garden. The tea and snacks are mediocre at best and the experience is decidedly "touristy," but it doesn't deter visitors and the Tea Garden is often packed. A good way to better understand the Japanese Tea Garden is on a guided tour. Docents from the San Francisco City Guides lead tours of the Japanese Tea Garden and the schedule is on their website. The Tea Garden is at 75 Hagiwara Tea Garden Drive, just off John F. Kennedy Drive and next to the DeYoung Museum in Golden Gate Park. You can park on the street nearby, or in the public parking lot beneath the Academy of Sciences. The garden is open 365 days per year. They charge admission (which is lower for City of San Francisco residents), but you can get in free a few days a week if you go early in the day. Check their current hours and ticket prices on the Tea Garden website. Wheelchairs and strollers are allowed in the garden, but getting around with them can be tricky. Some of the paths in the garden are made of stone and others are paved. Some of the paths are steep and others have steps. There are accessible paths, but markings may be hard to follow. The Tea House can accommodate wheelchairs, but you have to climb a couple of stairs to get into the gift shop. You can also see more plants and flowers in the San Francisco Botanical Garden and the ​Conservatory of Flowers.